This is the home of the Dosbox port to OS/2. Below are the files released until now. You can find more informations about Dosbox here. 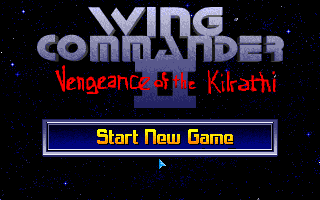 Screenshot from Wing Commander II. DOSBOX.EXE: This is the normal version. No debugging support included. DOSBOXD.EXE: This is the debugging version. DOSBOXHD.EXE: This is the heavy debugging version. The mouse is now captured if you press CTRL+F10. Also, pressing and releasing ALT doesn't activate the system menu anymore. Now included in the package are debug versions of the three executables. Their names include a "_d" prefix, e.g. the debug version of dosboxd.exe is dosboxd_d.exe. This version fixes the mispainted key mapper. The DLLs needed by DOSBOX/2. This package will stay the same in the future. The release binaries of DOSBOX/2 Beta 3. The debug binaries of DOSBOX/2 Beta 3. I will prepare a source package soon. For the naming convention of the binaries see above. I submitted a patch against the 0.63 source tree. You can download it from sourceforge. This package just gives you what need to run Dosbox. The package includes KEYB.EXE from FreeDOS plus precompiled keyboard layout and some language files for DOSBOX. (2006/04/28) The 0.65 release of DOSBOX/2 is out!